Tottenham's 22-year wait to finish above Arsenal is over but their title chase is not done yet after Dele Alli and Harry Kane sealed a 2-0 victory in White Hart Lane's last north London derby. Only 146 seconds separated Alli's second-half opener and Kane converting from the penalty spot as Spurs moved 17 points clear of the Gunners and made it mathematically impossible for their rivals to close the gap. 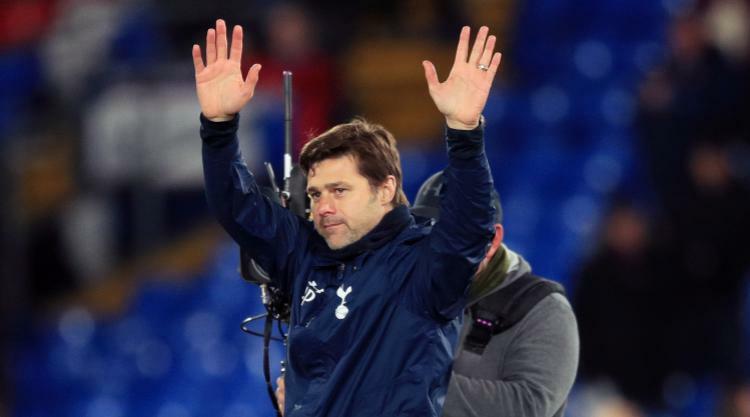 Tottenham's victory was only tarnished by Chelsea's emphatic 3-0 win at Everton earlier in the day, which means they could just reduce the difference at the top back to four points. Chelsea have Middlesbrough, West Brom, Watford and Sunderland left to play and this could well prove the day Antonio Conte's men tightened their grip on the trophy. There was little sign of disappointment for Spurs fans, however, who have not toasted finishing a league season above Arsenal since 1995, an achievement made all the more sweet given it came in the final run of this fixture at this current ground. Tottenham confirmed on Friday they will move to Wembley next season, making this the last north London derby at White Hart Lane before the club opens its new stadium in August 2018. For Arsene Wenger's men, the challenge of sneaking into the top four has become even more acute. They now sit five points behind Manchester City and four back on Manchester United, albeit having played one game less than both, with next weekend's match at home to United now taking on even greater significance. Mousa Dembele's ankle injury meant he was fit enough only for a place on the bench as Eric Dier partnered Victor Wanyama in midfield. Laurent Koscielny shook off a knee problem to start at the centre of an Arsenal back three while Aaron Ramsey came in for Francis Coquelin. Kane tested Petr Cech with an early shot from the angle but Arsenal were comfortable in the first 20 minutes, disciplined in defence and determined up front to stop Spurs playing out from the back. Two Tottenham chances, however, arrived in the space of two minutes and they should have scored from both. First, Alli nodded Kane's deflected shot wide at the back post and then it was Son Heung-min's effort that ricocheted invitingly into the air but this time Christian Eriksen volleyed over with the goal gaping. That was as close as Spurs came in the opening period and in fact it was Arsenal who finished the stronger, Ramsey stretching Hugo Lloris with a guided shot towards the far corner before the unusually quiet Alexis Sanchez bent one wide of the back post. Wanyama and Olivier Giroud both fired off shots at the start of the second period, the former's tipped over, the latter's ballooning high without any extra intervention. But just before the hour-mark, Tottenham came to life. It began with Eriksen dancing his way through Arsenal's defence, and while Cech blocked the Dane's angled finish, Alli was on hand to slot home his 17th league goal of the season. Pochettino had barely stopped pumping his fists when Spurs doubled their lead, Gabriel sticking a lazy leg out to bring down Kane in the penalty area and the striker stepping up to to convert his sixth goal in five games against this opposition. Tottenham smelt blood and soon went looking for a third. Jan Vertonghen's curling shot had to be palmed away by Cech and Arsenal were fortunate not to concede another penalty when Sanchez blocked Son's flick with his arm. Toby Alderweireld sent Cech diving into the air again with a bullet header from a corner late on and Arsenal never looked like mounting a comeback.